I’m in the middle of my Chrysalis Woman Circle Leader training program and enjoying it very much. 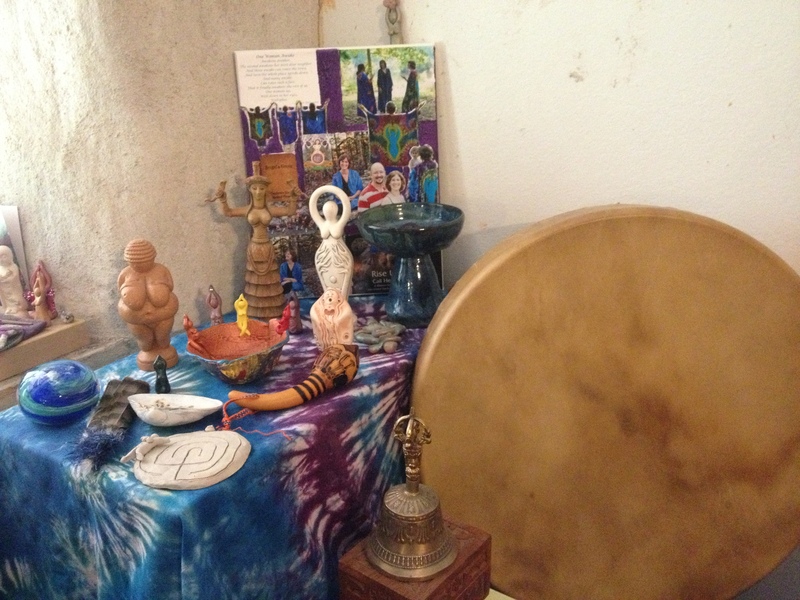 As one of our assignments were were supposed to create a priestess collage as well as a new circle leader/priestess altar. As I prepared the altar, I found myself singing the little song above. I later googled it just in case, but it looks like I did actually make it up in that moment at my altar. That is what I do with my work: gather the women. And, I want them to feel welcome in the circle. Sometimes I feel discouraged though and I wonder if this work matters. I wonder if people really can work together “in perfect love and perfect trust,” I wonder if people like me and I them, and I struggle with wanting to reach “more” women, rather than being completely satisfied with the small group of beautiful souls who do regularly show up to do this work with me . So, I really appreciated Lucy Pearce’s recent blog post on the subject of, if what I do is women’s work, why aren’t women interested? I had just done a book reading of my #1 Amazon Best Selling book, The Rainbow Way… to an audience of one. 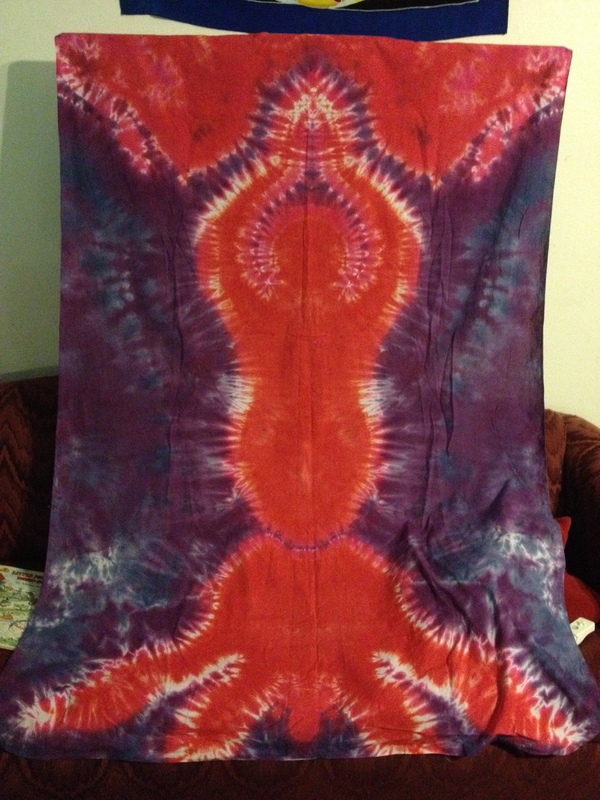 I had just led a red tent circle with 14 women… most of whom had travelled 40 minutes or more to be there. I am about to lead a workshop… a free women’s workshop… and am aware that numbers may well be small. Where are all the women? If this truly is women’s work… then why are they at One Direction in their tens of thousands… and not here? Why are they reading 50 Shades… and not Moon Time? via Why Aren’t Women Interested? | The Happy Womb. Once at an LLL meeting I mentioned wanting to start a group called “mothercraft” or “womancraft.” Another woman there said it sounded interesting, but if that is what it was called she would never come. I surmised because it sounded too much like “witchcraft.” I think many women retain a deep-seated, historically rooted fear of being labeled witches. Maybe that sounds silly, but I think it is real. I am very, very carefully planning for my Red Tent even in August without including the word “Goddess” in any chants/rituals, because I want to make sure to speak to the womanspirit within all of us, rather than being associated with any one framework of belief. My observation is that Red Tent spaces have this ability to transcend any particular belief system and welcome women of many backgrounds, inclinations, and beliefs. They aren’t specifically “Goddess circles,” though they honor the divine feminine through their very being. I hope I am able to hold this space as well. Someone commenting on Lucy’s post said maybe women don’t need her work because they don’t feel “oppressed.” I thought about this and realized that I haven’t ever felt particularly oppressed personally, but I still need womancraft for celebration AND because even though I haven’t been directly oppressed, that doesn’t mean countless women around the world are not—I take a stand and lend a voice in my work for a different, healthier world for women. Another observation I’ve made is that women have a lot of trouble viewing women’s circle activities as something other than an “indulgence” or something frivolous and so it is easy for them to talk themselves out of it or not be able to give themselves the time/space for it, even though they are deeply intrigued and interested. 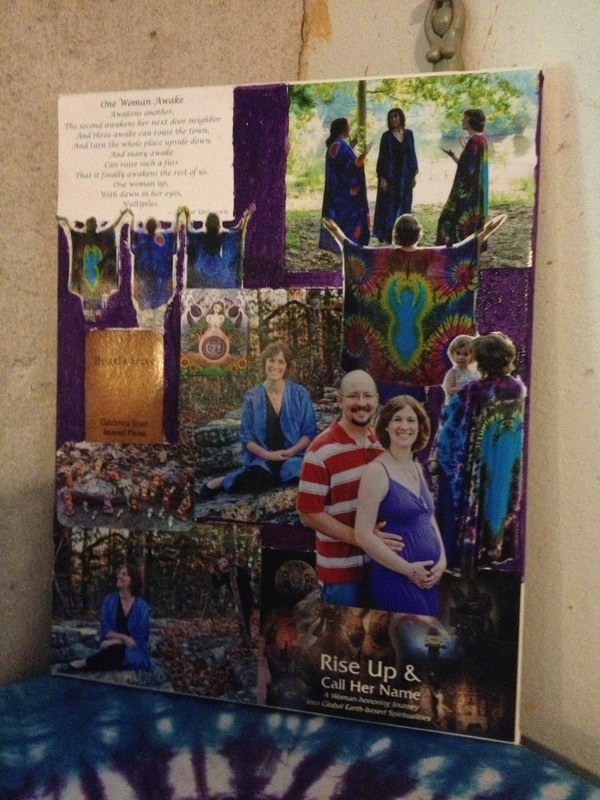 Finished priestess collage for CW training. when defeated, rally once more. to bring that vision into reality…. …I’ve been feeling a little discouraged about my retreats lately, primarily because there are a lot more women on the email list than actually show up and so I always feel like I’m doing something “wrong” or am not planning interesting enough things to attract them. I also take it kind of personally—there is a vulnerability in preparing an offering such as this and each time I do it I actually feel like I’m preparing a gift for my friends. When they decline the invite, it feels, in part, like a rejection of the gift I’m offering. Cognitively, I know (or, I hope! ), this isn’t true, but emotionally that is how it usually registers. This summer retreat was a beautiful experience that felt just as I wish for these retreats to feel—nurturing, affirming, and celebratory—like a blessingway for all of us with no one needing to be pregnant! There is nothing like having friends who are willing to lie on your living room floor and listen to a shamanic drumming CD without laughing or saying you’re ridiculous. 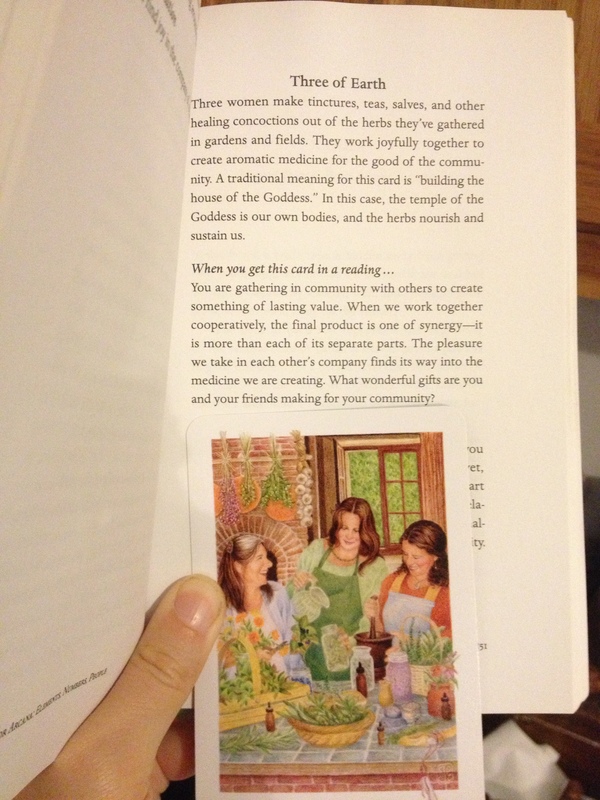 via Ritual Recipe: Women’s Summer Retreat | WoodsPriestess. 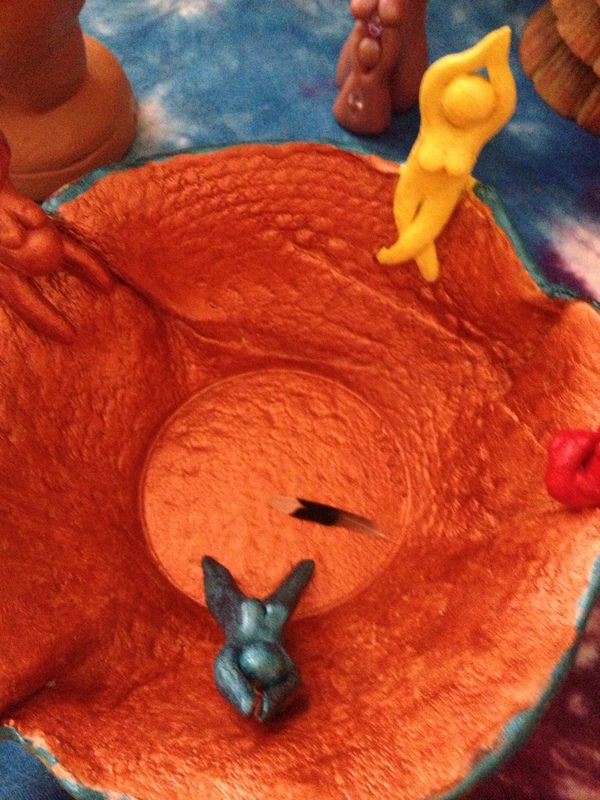 At the center of my Chrysalis Woman priestess altar, I put this bowl that I made during one of our retreats and painted after another one. It felt like a symbol to me of gathering the women. Inside of it, I actually ended up putting some little gifts different friends have given me, but first I put in this tiny hummingbird feather as a reminder that these circles and relationships are delicate, surprising, and beautiful and need to be treated with care. Earlier this month I received a lovely surprise birthday gift from a talented friend and it is perfect for all the Red Tent plans afoot for August! I’m working on collecting red fabric and cushions as well. 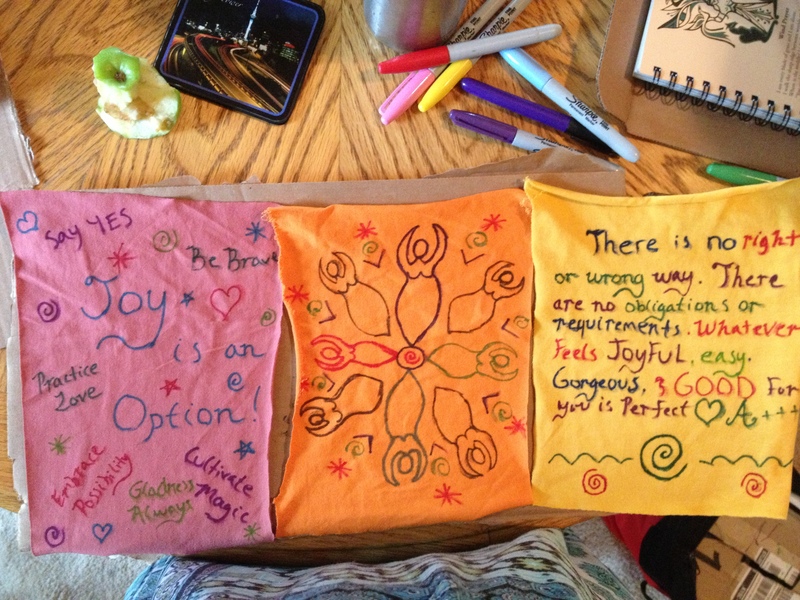 A few weekends ago, we made prayer flags for a friend and I used different quotes from the Amazing Year workbook on mine (I also presented about this workbook at a conference last week). 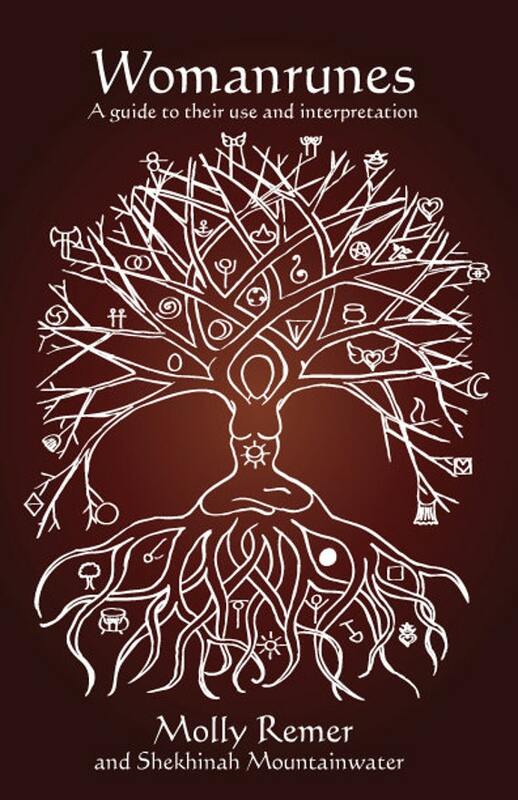 And, I found out just today that my Womanrunes workshop was approved for this year’s Gaea Goddess Gathering in Kansas! Encouragement For Women’s Workers Everywhere: When You Are Feeling Downhearted, Alone and Misunderstood | The Happy Womb. Gather the women. They are welcome here.